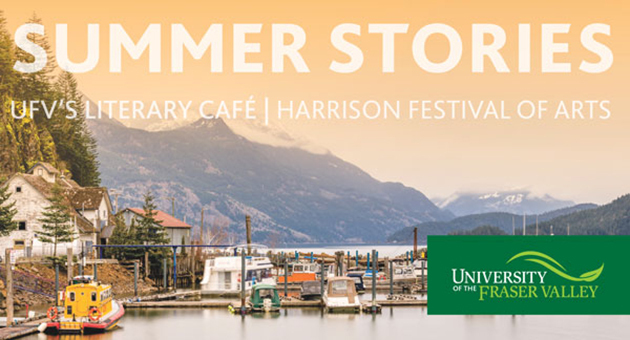 UFV’s Literary Café at the Harrison Festival of the Arts offers an intimate opportunity to get up close and personal with some of the west coast’s brightest writers and poets. Join us on July 10 for an evening of summertime stories that celebrate nature in beautiful British Columbia. This year we introduce a vibrant mix of rock stars, writers, poets, educators, and eco-activists whose works are featured in the recently released collection, The Summer Book, published by Mother Tongue Press. UFV alumna and Raspberry Magazine editor Katie Stobbart will host this year’s event. The Literary Café is sponsored by UFV’s Department of Continuing Education and the Kuldip Gill Writing Fellowship. Grant Lawrence is an award-winning author, CBC personality, and singer. He will read from The Summer Book and from his second new work, Dirty Windshields — a long-awaited memoir that bares all of the salacious and hilarious details from his touring days as the lead singer in the Vancouver-based rock band, The Smugglers. Chelene Knight is a Vancouver-born writer and poet who has been published in various Canadian and American literary magazines. Her first book, Braided Skin (2015) has given birth to numerous writing projects. She is currently working with fiction mentor Jen Sookfong Lee on a novel (Junie) set in Vancouver’s Strathcona neighborhood during the 1930s. Trevor Carolan began writing at 17 and hasn’t stopped since. He has published 20 books of poetry, non-fiction, fiction, translations, and anthologies, as well as scores of articles and interviews. His work has appeared in five languages and includes Giving Up Poetry: With Allen Ginsberg at Hollyhock, a memoir of his studies with the late-American writer and activist. He has taught English and Creative Writing at UFV since 2001. Bren Simmers is the author of two books of poetry, Night Gears (2010) and Hastings-Sunrise (2015), which was a finalist for the City of Vancouver Book Award. She has won the ARC Poem of the Year Award and is currently the 2016-2017 Writer in Residence at the Ranger Station Art Gallery in Harrison Hot Springs. The Literary Café is sponsored by UFV’s Department of Continuing Education and the Kuldip Gill Writing Fellowship.